Ligeia Mare, the second-largest known sea on Saturn's moon Titan, is filled with liquid hydrocarbons, including methane and ethane. This false-color image comes from data collected by NASA's Cassini mission. Saturn's moon Titan and Earth are even more alike than previously thought: New research shows that the giant moon has a global sea level, just like our own planet. Earlier observations have shown that Titan has a dense, Earth-like atmosphere, as well as stable liquids on its surface — although Titan's seas consist of hydrocarbons like methane and ethane rather than water. Two new studies from Cornell University have revealed yet another striking similarity between Earth and Titan, according to a statement from NASA. 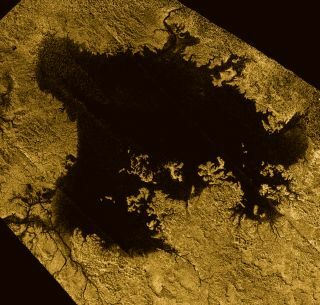 Using data from NASA's Cassini spacecraft, the first study provides the most detailed topographical map of Titan created to date. Building on this, the second study shows that Titan's largest hydrocarbon seas and lakes lie at an average elevation, or "sea level," much like bodies of water on Earth, according to the statement. Both studies were published Dec. 2 in the journal Physical Review Letters. Specifically, the topographical map revealed several new features on Titan, including mountains that stand up to 2,290 feet (700 meters) tall and depressions in equatorial regions, which researchers said could be caused by either ancient, dried seas or flows of material produced by ice volcanoes. The new map also suggests that the moon is more oblate — or flatter, rather than more spherical — than previously thought, meaning that the thickness of Titan's crust is more variable than expected, according to a statement from Cornell University. Using this new topographical information, the researchers were able to determine that Titan's largest liquid lakes and seas follow a constant elevation relative to Titan's gravitational pull — just like Earth's Atlantic and Pacific oceans do. Furthermore, the second study showed that Titan's smaller lakes appear at elevations several hundred feet higher than the moon's sea level. This, researchers say, is also commonly seen on Earth. For example, Lake Titicaca in the Andes Mountains is more than 12,000 feet (3,650 m) above sea level, according to the NASA statement. However, the newfound similarities between Titan and Earth don't stop there. The new study suggests that liquid bodies on Titan are connected beneath the moon's surface, resembling aquifer systems seen on Earth.